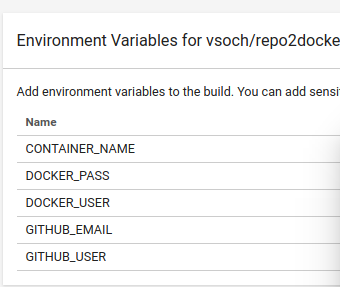 Want to be notified of new releases in vsoch/repo2docker-jupyterlab? too long, didn't read... here is the example! Now build your own, with your own code to share, a la containershare! Thanks to the project jupyter team and @blink1073 for the team effort on this container. the requirements.txt defines what will be installed in the notebooks. the postBuild script installs jupyerLab extensions and widgets. The build->test->deploy setup will have integration for a containershare registry. In a nutshell, when you add the configuration files here to your repository and connect to continuous integration, you will get a container, Github pages to serve metadata with complete manifest and inspection of your containers. It's a completely free, transparent, and open source way to practice reproducible science. See here for a demo of JupyterLab. Note that we are currently using jupyterlab 0.34 and the geojson extension version 0.17. This usage is adopted from the continuous-build repository. The software has been extended to deploy metadata and a web interface to explore it back to the Github repository. As described above, you will be able to push a Docker container to Docker Hub directly from a Github repository that has a Jupyter notebook. container you generate a Docker Hub container with your notebook and dependencies, ready for use wherever you can run the container. The container always provides a latest, but also a tagged version coinciding with the first 10 characters of each merged commit. inspection using the container-diff tool, every tag of a container has apt, pip, and files recorded. Yes, this means that you can programatically find containers based on software. @vsoch will be developing a command line tool to help with this. Fork and clone the continuous-build Github repository to obtain the hidden .circleci folder. First, fork the repo2docker-jupyterlab Github repository to your account, and clone the branch. Click on "Add Projects", and select your regular Github username under "Choose Organization". This is the owner of the project. Then click "Follow Project" next to the repository name on the left of the menu. If you don't see the project there, copy paste the link to it directly. Once the environment variables are set up, you can push or issue a pull request to see circle build the workflow. Don't forget that you will need to change the default in settings to also build pull requests. Remember that you only need the .circleci/config.yml, .circleci/template.html and not any other files in the repository. If your notebook is hosted in the same repo, you might want to add these, along with your requirements.txt, etc. The dependencies are managed in the requirements.txt files in the binder folder. You can add modules here to customize your jupyterlab container. If you want to get help please post an issue!.